If you win this conspiracy, choose any number of conspiracies or stories. Return each character committed to those stories or conspiracies to its owner's hand. 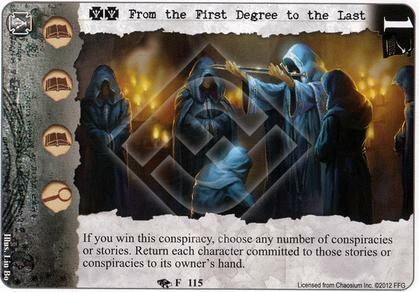 Chosen for card of the day 20th June, as every other faction has a minimum of 2 conspiracies (Agency with 6! ), and I felt it is easy to forget that this conspiracy exists. It supports the occasionally used ST effect of bouncing characters back to their owners hand. But for this conspiracy, by looking like you will win it that turn, by also going into other stories you opponent may be more hesitant to oppose them - Would you oppose a Guardian of Day or Zanni knowing normally you would crush them, but risk your costlier character returning to hand? You can even use this combined with your own characters who have effects for entering/leaving play, so this story is resolved last, place your tokens on other stories, then watch your characters bounce back, ready to trigger again. the other thing I like about this conspiracy are the icons, specifically how it lacks Terror and Combat. Less observant opponents may not realise, only noticing that there are 4 struggles, send in a high terror/combat character, only to then realise it is simply adding opposed skill and nothing more. Combine it with MU or Yog for the story attachments Excavation Site and Tear in Time respectively, where they will be triggered much more than they would on a normal story. I had a version of my Struggling Artist deck with ST & Yog that had this conspiracy in it. It ended up being too difficult to resource the way I had it built, but might be worth a second look. Matched with Stealing the Glory it is easy to quickly put success tokens on it. I felt it is easy to forget that this conspiracy exists. Not a bad one, though, although that's more because of it's icons than it's effect. Yog/ST should get some good mileage from it. It seems kind of complicated to combo this with a bunch of other cards that manipulate arcane, when you could just focus on efficient characters for the typical story struggles. I think this would be a card you would want to stick around to combo off winning arcane, not really to rush it off the board. Perhaps in a Lost Oracle deck?